The 30-06 Springfield was invented in 1906 and has been used in military, hunting, and sport shooting rifles for decades. Capable of long range applications, the 30-06 is one of the most popular hunting rounds in the world. 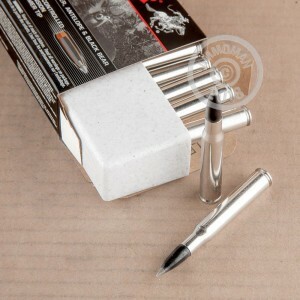 With Winchester rounds in your rifle, you are getting some of the best ammo you can find. 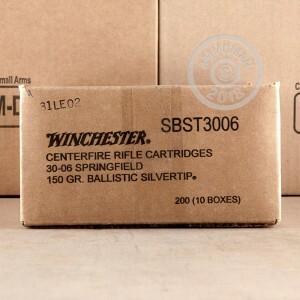 In business since 1866, Winchester has mastered the art of manufacturing ammunition. 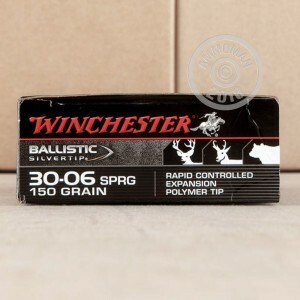 No matter what kind of ammo you are looking for, Winchester usually has it and quite possibly helped develop it. These ballistic Silvertip rounds feature 150 grain polymer tipped projectiles that deliver rapid, controlled expansion for hunting deer, antelope and black bear. Great accuracy, amazing terminal performance, and fantastic range, these rounds have what you need for a successful hunting trip.